Without a doubt, Chinatown is one of my favorite parts of the city. I just came back from a month-long study abroad adventure in Shanghai, and even though I was in the Motherland, I found myself missing dim sum at the Golden Unicorn and late-night lo mein at Wo Hop. If you haven't had your own culinary adventures in Chinatown, it's a great time to start. 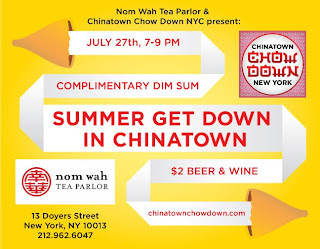 On Wednesday, July 27, enjoy Dim Sum and Drinks at Summer Get Down. 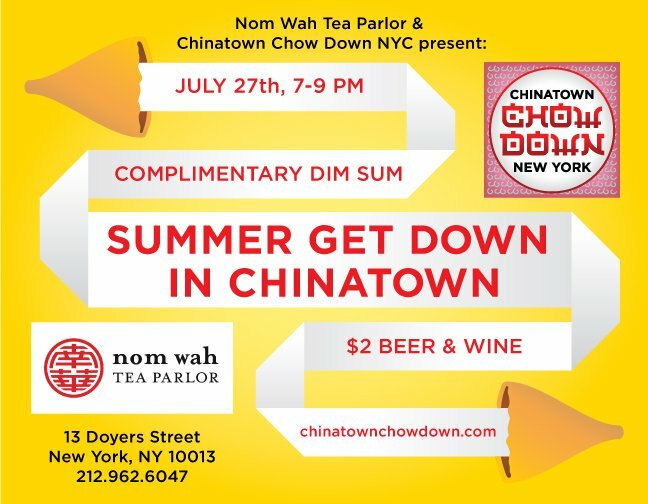 A collaboration between Nom Wah Tea Parlor and Chinatown Chow Down NYC, there will be loads of complimentary dim sum and $2 beer and wine. The event will celebrate the brand new renovation of Nom Wah, which is the city's oldest Dim Sum restaurant (90 years old! ), the launch of their new T-shirts, as well as the release of the Chinatown Chow Down NYC App on iTunes. The Chinatown Chow Down App is an awesome guide to eating in Chinatown, perfect for those of you with iPhones and iPads, looking to explore this part of the city. Should be a fun event, and if you attend, don't forget to hit up Chinatown Ice Cream Factory afterwards for a yummy treat! To check out the app, click here. To check out Nom Wah Tea Parlor, click here.